New research suggests there is an opportunity for businesses to get ahead of their competitors by generating reviews from their female customers. If you’ve read any of my pieces before, you’ll know that I’m an avid advocate for reputation management and the power of online reviews for local businesses. Today, I’m not here to bang that particular drum but to take a deeper look into how gender can play a role in consumers’ behaviors around online reviews. My company, BrightLocal, recently released its annual Local Consumer Review Survey, which polls a representative sample of 1,000 US consumers on how they use online reviews. We’ve been doing this for a few years now, and it always garners a lot of interest and commentary, but for the first time we have analyzed the age and gender splits in the responses to the survey questions. If you’re interested in the generational splits, you’ll find them over on the main research piece, but what I’d like to share exclusively with my Search Engine Land readers today is how men and women differ in their attitude to, and experiences with, online reviews. Before I go ahead, I’d just like to assert my belief that gender exists on a spectrum, but for this study, we grouped those who identified themselves as male or female in their survey responses. So without further ado, let’s get on to the results! Going into this study, we had no preconceived notions about how different genders might use online reviews, but what we discovered were some very marked differences in behaviors. To start with, while a similar proportion of men and women said they “regularly” read reviews for online businesses, there’s a large gap between the men and women who “always” read online reviews for businesses. 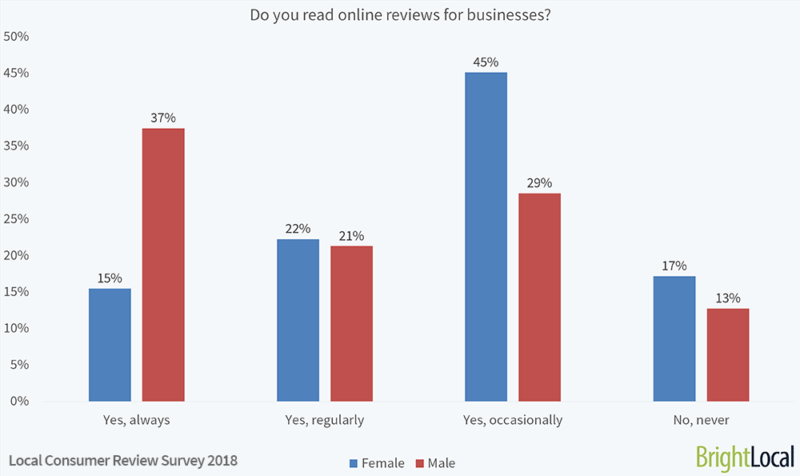 As you can see above, 37 percent of men said they always read online reviews for businesses, but a comparatively small proportion of women (15 percent) do the same, preferring instead to “occasionally” read online reviews. This means that if your customer base is skewed to the male side, it’s very important to be investing time and effort into securing high-scoring reviews. Star rating isn’t the only thing to focus on, though, as our original survey reports that a huge 40 percent of consumers don’t pay attention to reviews over two weeks old. While it’s not my place to offer conjecture based on stereotypes, it is possible that the nature of goods and services purchased from local businesses by men, and their attitude towards shopping, affects how seriously they take a business’ reputation. Conversely, our survey suggests that women don’t seem to be quite as thorough in their research, something that’s potentially impacted by the age-old “impulse buy.”. I appreciate that the above chart does show that the majority of respondents have been asked to leave a business review, but the real shocker here is the difference between men’s and women’s experiences. While only a quarter of men have never been asked, a significant 44 percent of women haven’t either. Whether this is down to staff finding men more approachable than women when it comes to collecting reviews is a matter for a more detailed study, but the numbers certainly suggest something is hindering the growth of reviews left by women. The other thing to note here is the difference between the numbers of men and women choosing to leave a review when asked. More than half of the all the male consumers polled left a review when asked to, showing their willingness to provide feedback, whereas a smaller (though no less significant) proportion of women respond favorably to a review request. What’s the takeaway here? Make sure you or your clients’ staff are, if possible, asking fairly equal numbers of men and women for reviews. If the above chart is to be believed, 37 percent of those women you’re not asking for reviews present a large missed opportunity, as that’s the proportion who are open to leaving business reviews. The latest Moz Local Search Ranking Factors Survey shows that experts believe in the growing influence of reviews on local pack rankings, as review signals have seen a 2 percent boost in that survey, year on year. There’s also a lot of speculation around whether responding to reviews helps to boost local search rankings (as well as the obvious benefit that comes with showing your business cares). As part of Moz’s survey, Ben Fisher noted that, “reviews (along with an owner’s response) show that consumers trust a business, and trust is a foundational factor in ranking,” and I firmly agree. Responding to reviews, especially recent ones, shows that your business is alive, and I’d go as far as assuming search engines take this vitality into account when ranking businesses. Think you’ve seen this chart before? I don’t blame you! The results are remarkably similar to the question, “Do you read online reviews for businesses?” at the top of this article. And that’s not down to the same people answering in the same way. In fact, this question was only asked to the 84 percent of respondents who told us they do read online reviews for businesses. It’s important to a large majority of consumers that businesses respond to their online reviews, but interestingly, men are far more concerned with this practice than women, with 37 percent of male respondents saying they always read review responses. This is the first time we’ve asked questions about responding to reviews in the Local Consumer Review Survey, so it was particularly interesting to dive into this untapped well of consumer opinion. When it comes to the types of responses consumers feel businesses should respond to, you might be surprised to hear that 30 percent (men and women combined) say fake reviews should get responses. And when we slice the data by gender, we see an interesting pattern of men thinking positive reviews are more important to respond to (58 percent) than negative ones, and women feeling that negative review responses (63 percent) are more important. So what can you do with all this data? Well, first of all, I’d say that any local business that caters very firmly to men should be developing a particularly strong focus on their reputation management and review growth strategies. Men not only value the reviews themselves but also their responses. If you’re working with businesses for whom a female audience is key, then I’d recommend ensuring your strategy involves asking for more reviews, whether that’s by email, a sign at the point of sale or in person after the customer experience. Our research shows that there’s an opportunity here for businesses to get ahead of their competitors by generating reviews from their female customers. Other than that, I certainly don’t feel you should be treating men and women differently when it comes to asking for or responding to reviews. After all, the most successful reputation management strategies are often the smoothest and simplest!